1961-62 Series saw India winning their first series against England after the whitewash of 1959 series. First three tests ended in a draw with Barrington playing a dream series with unbeaten centuries. But the last two tests were won by India. There were good batting performances from India, specially by Vijay Merchant. But Durani and Borde gave allround performance to win the series for India. England suffered its first series loss against India. Although even in the absence of major players the English batsmen came good with four of them aggregating more than 300-runs in the series, the bowlers could not be much effective and that costed them the series. Salim Durani’s, besides Chandu Borde’s, all round performance was the major difference among the two teams. The Series belonged to Barrington who aggregated 594 that included three centuries and a half-century. Captain Dexter (409), Openers Pullar (327) and P Richardson (304) also relished the Indian attack. Vijay Manjrekar scored 586 runs with a huge century, and 4 big half-centuries, one of which missed the century by 4 runs. Jaisimha (399), Borde (324), Umrigar (254), Pataudi Jnr. (222) and Durani (199) were other prominent scorers of the series. Indian bowlers grabbed 67 wickets in the series led by batsmen. Durani with 23 wickets emerged as the best bowler of the series. Borde (16), Ranjane (9) and Gupte (7) helped him on crucial moments of tests. Ironically English bowlers also took 67 wickets even in the absence of star Trueman and Statham. Yet the wickets did not come at crucial junctures. G Lock (22) and D Allen (21) emerged as their best bowlers of the series. Dexter scored 409 runs and took 4 wickets too. 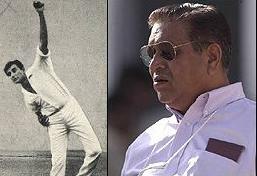 Nari Contractor got in the record books as being the first Indian captain to win a series against England. But his performance as opener to score 180 runs in 8 innings with one half-century was not that impressive. Both English keepers – J Murray & Millman – failed to impress. For India, Kunderan could not succeed in the series and his replacement young Engineer scored 135 in 6 innings with a half-century. Durani and Borde changed the series. Borde scored 324 runs and grabbed 16 wickets while Durani scored 199 runs and became the highest wickettaker of the series with 23 wickets.